This year I have tried to be as good as possible. I have exercised like you suggested, eaten lots of fresh veggies and fruits, done my best to reduce stress, remained positive, and most importantly tried to help my neighbours as often as I can. All in all Santa, it’s been a great year. I have had very few issues with my Multiple Sclerosis (MS) and am pretty darn happy. Because of your suggestion Santa, I do not need anything this year, however some of my friends with Multiple Sclerosis do. So I was wondering Santa, this year, would you mind giving them the cure for MS? And if you can’t do that Santa, then could you please help my friends with MS who can’t walk, walk again? It would be great if they could walk on Christmas morning. And if that is not possible Santa, could you please help my friends with MS who are unable to get out of bed each day because of fatigue, feel energetic? I would really like it if they had enough energy to decorate the Christmas tree with their families. And if that is not possible Santa, would you be able to help my friends with MS who have seizures, spasms, tremors or spasticity regain control over their bodies? It would be so much easier for them if they could open their Christmas gifts without shaking. 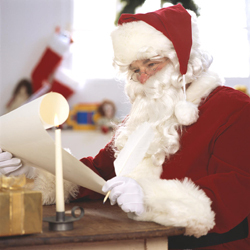 And if you can’t do that Santa, would you be able to give my friends with MS who have difficulty seeing, 20/20 vision? I would really love it if they could see what you look like. And if that is not possible Santa, I would really appreciate it if you could help my friends with MS who have difficulty speaking be able to carry on conversations like everyone else? It would be great if their sons and daughters, brothers and sisters, mothers and fathers and grandmothers and grandfathers could hear them say I love you on Christmas day. And if you can’t do that Santa, if it is not too much trouble, please help my friends with MS who are depressed feel joy. Everyone should feel joy at Christmas. And finally Santa, because I truly have all that I need, from this day forward, would you mind donating any future gifts for me for in upcoming years to the MS Society of Canada so they can continue to help my friends with Multiple Sclerosis. Thanks Santa. Merry Christmas to you, Mrs. Clause, all of the elfs and the reindeer. P.S. Just in case you do stop by I will leave a glass of almond milk and some vegan brownies for you on the table by the big comfy chair. Thanks Susan that was great and very generous of you to suggest all those things for everybody else! Blessings to you Susan and all my dear friends..wishing you a year of strength, peace, and joy.